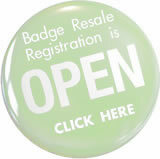 Didn’t score a ComicCon ticket to the 2011 event in the handful of mad badge sells? You aren’t totally out of luck. The date for returns for refunds has passed and now SDCC once again has badges available to sell to us slavering, eager fans. The small pool of returned 4-day passes has already been sold out, so no joy there. However, The Con will be opening sales for the returned single day tickets soon. How soon? Probably this week sometime. An hour before ComicCon opens badge sales they will announce it on their Twitter, Facebook, website, etc. You’ll know when tickets are actually selling when the big button on their Attendee Badge Return Resales page goes from being grayed out to all four-color and linked to the badge sale site. Single day San Diego Comic Convention 2011 Ticket re-sale prices are from $13-$40. A MAX of two SDCC tickets per person. So, if you have to buy Saturday and Sunday tix for, say, you and your spouse, you either need to prioritize a day and get both theirs and yours or let them fend for themselves. I don’t really understand, does 2 tix mean only 2 tix per PERSON or per DAY? It is per PERSON. SDCC does not specify on their site how their registrar, EPIC, determines ‘person’. It may be by actual name, it may be by email, it may be by IP address – that one’s the most likely.